Price(s): $50-75 per person (Depending on group size); PRIVATE GAME! 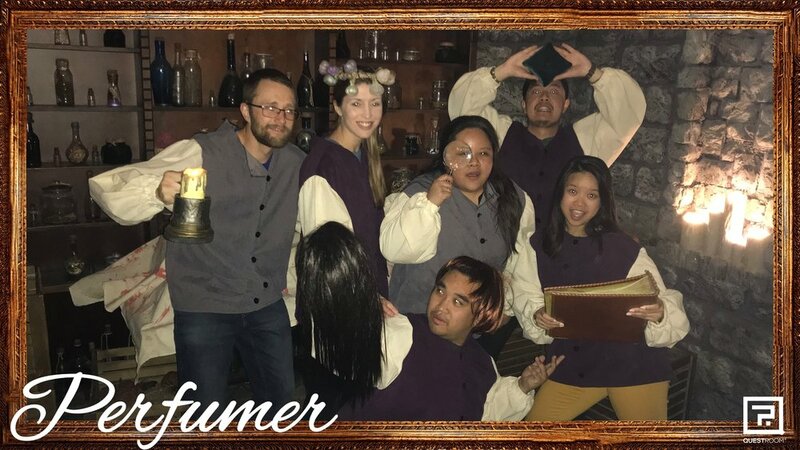 To our team’s surprise, we haven’t heard any escape room reviews about The Perfumer prior to our escape. Quest Room was always one of our favorite escape room companies and we were ready for this! It’s also a joy to start off putting on 18th century French costumes before we start the adventure! Loved the puzzles! Challenging, somewhat different, and a lot of technology was used. Our group enjoyed how multi-linear the puzzle flow fo the escape room. Some of the puzzles remind me of one’s I’ve seen at Maze Room, 60out and Escape Room LA, however, this escape room present and execute their puzzles better. Quest Room is typically known for their extensive use of technology. The technology used in this escape room is unmatched. Although this is a 90 minute room, an experienced escape team of 4-6 could get out around the 60 minute mark. It does make sense that it’s a 90 minute room with the amount of things that need to be done. From start to finish, the escape room’s immersiveness was superb! One could tell that every detail of the room was carefully designed. The room in the beginning is quite small for our group of 6 and it was difficult to navigate ourselves as well as to complete the puzzles. Later, Perfumer became much more spacious which was beneficial considering the multi-linearity of the puzzle flow. Immersion for Quest Room is always awesome! To put it simply, Bloody Elbow and Da Vinci’s Challenge had a baby and decided to call it “Perfumer”. lol. This escape room is on the expensive side ($50-75/person) as it takes account that it’s a 90 minute room. Is it worth the money? I would agree. If you have the money for it…YES!